As a beginner jazz guitar can seem a very daunting genre to study. However, don't be put off learning jazz guitar because it sounds too challenging. It's just a case of training your ear to jazz harmony, which is generally less conventional and formulaic than rock and pop. Take it one step at a time and you'll be surprised at how quickly you progress. Make sure you've been through the theory section on this site before you tackle jazz, as the genre requires a solid theoretical foundation. 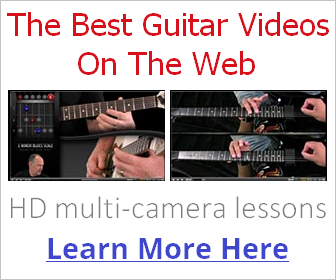 The jazz guitar lessons below will take you right from the basics, providing you with a springboard for more advanced theory and technique (a lot of which already exists in the various sections of this site). Beginner Jazz Guitar Looks at basic jazz chord voicings and progressions and introduces you to the shell chord forms commonly used in jazz. A logical place to begin, since it lays the foundation for the jazz chord progressions you'll later be improvising over. Jazz Blues Soloing Jazz blues is a great genre for getting to know key staple jazz progressions and licks. This video series shows you how to play a 12 bar jazz blues solo in Bb with in depth analysis of the solo from a theoretical standpoint. Jazz Guitar Scales Comprehensive jazz scale library showing you how they appear on the fretboard and their associated chord types. Includes major and minor modes, bebop, whole tone and diminished scales. Jazz Solo Arrangement This beginner jazz guitar video series takes an example song and shows you how to practice your solo arrangements with detailed breakdowns of phrasing ideas and note selection. Jazz Chord Solos Looks at chord phrasing and weaving harmonies through jazz chord progressions. This is an especially important technique for solo jazz guitar (as in playing without accompaniment!). Also some great chord voicing ideas building on the first lesson.